SAVE YOUR MONEY AND HASSLE – Never Waste Your Money on Batteries again! Save Yourself the Hassle to Replace Batteries Every Week, It’s a WIN-WIN! 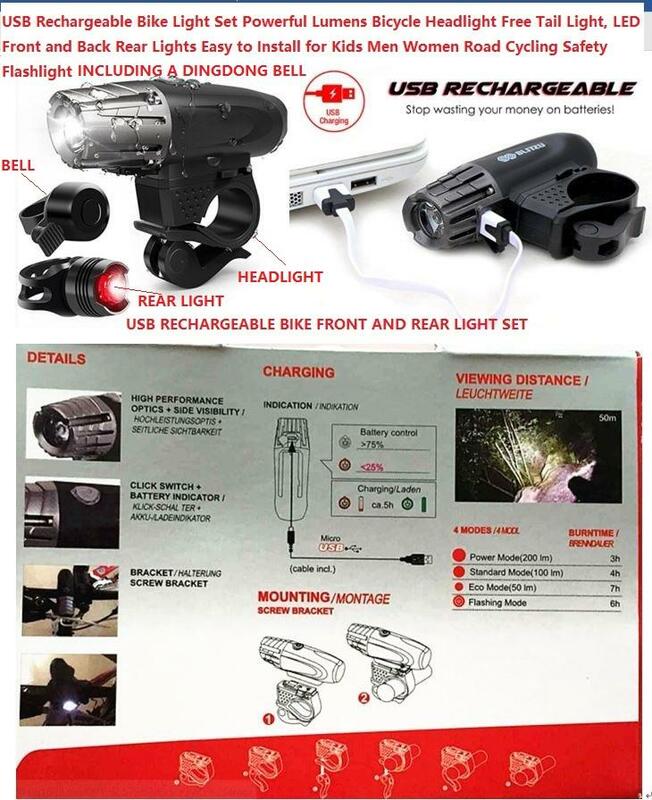 The bicycle head light is USB Rechargeable. It charges from your computer or any device with a USB port. This headlight only takes 2 hours to fully charge and has a Runtime of 2+ hours on the highest setting, making it the BEST SELLING bike lightIN THE INTERNAITONAL MARKET. VERSATILE, MORE THAN A BIKE LIGHT - Can be used as an emergency flashlight, keep it inside your car, basement, attic, and emergency kit. Use it when you’re running, jogging, hiking, camping, walking your dog, cycling, changing a tire, night time family/kids activities, power outage and MORE! Enjoy enhanced visibility and comfort knowing you'll be safe and secure at any time of the day. GET YOURS TODAY! 360 DEGREE SWIVEL ABILITY AND INDESTRUCTIBLY BUILT - Practical, Reliable, and Durable. Rotate it to shine literally any direction you want. Features One Touch Quick Release Button, press and slide the light out without removing the whole mounting bracket, mount and detach in just seconds without tools! This Front Bicycle Light Constructed with Military Grade Anodized Finish. Impact resistant and built to perform. Water resistant rated to IPX5 - Protected against splashing water from any angle. THE PACKAGE INCLUDES A FREE DINGDONG BELL.